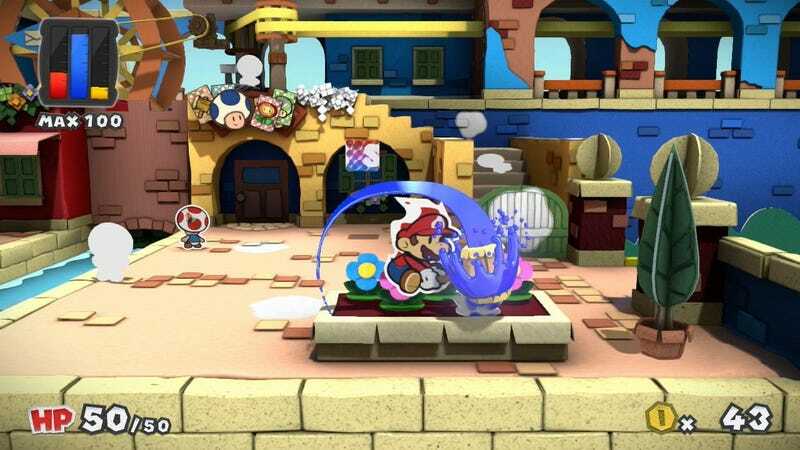 Nintendo has publicly denied that joke from an E3 demo for the upcoming Wii U game Paper Mario: Color Splash is a reference to a harassment campaign that targeted game designer Zoe Quinn. The company says it’s a nod to the Watergate scandal from the 1970s. While some observers saw this only as a nod to Watergate, taken in one context, they appeared to be a possible reference to the early days of Quinn’s online harassment. Without going completely down the rabbit hole, some took “five fun guys” as reference to attacks involving Quinn’s personal life in the summer of 2014. Those attacks involved a disturbing meme about the Five Guys food franchise. It’s easy to see, then, why one might take the next screen’s mention of “shufflegate” as a sly riff on GamerGate, the amorphous group that was ultimately born from Quinn’s harassment. Nintendo has categorically denied that the jokes were about Quinn. In Watergate, five men were arrested breaking into the Democratic National Committee’s headquarters at the Watergate hotel. (A group called the “Watergate Seven,” which included two aides to President Nixon, were ultimately tried against a judge for the break-in.) “Shufflegate: Exposed” could be a weird reference to a 2010 book called Watergate: Exposed or, more likely, nodding to how big scandals are treated in newspaper headlines. You can watch the sequence in question below. If you click play, it should pick up during Mario’s encounter with the Fungi Fun Guys group of toad characters. Though the screenshots suggest the dialogue takes place back-to-back, the pieces are separated by a few minutes of dialogue and action, as the toads admit to tricking Mario. And here’s the Fungi Fun Guys featured in Mario Party 8, released in 2007. That’s a nod to the doge meme, if you somehow missed that one. Watergate happened in 1972. GamerGate began in 2014. It’s easy to see why Internet savvy folks might conclude Nintendo chose more topical event. It’s the job of localizers to understand the context of their translations. Yes, Watergate kicked off the “gate” phenomenon, but GamerGate is fresh in people’s minds. Though the placement of the screenshots on social media proved more provocative than what’s actually in Paper Mario, if you’re familiar with gaming’s tumultuous events the last few years, it’s easy to look at Nintendo’s dialogue choices and come away confused and upset. Nintendo’s intentions are one thing, how they’re interpreted is another. Disclosure: Quinn formerly dated Kotaku reporter Nathan Grayson.